Can you spot my weakest discipline? Yes it is the Swim part of a Triathlon. During last Sunday's race I had the 55th "fastest" swim in my age group. My bike time was 4th fastest in the 40+ division, even thou I paced myself on the bike. I am an Ironman athlete and I am used to pacing myself for the 42.2km run waiting at the end of the bike. But feedback from coach after Sunday's race is we don't pace on Olympic distance racing. The email from my coach almost sounded like the Windhoek lager advert, South Africans will know but it's this guy instructing the other dude: "We don't drink pink drinks". Well when you do an Olympic Distance triathlon: "We don't pace our self"
And then on the run I had the 3rd fastest time in the 40+ division, something I am very happy with, a 41:41 run on the 10km. Above is the Garmin file of my bike and run. Only after reading @bigbradbrown blog did I go and check and yes the bike course was more than 2km's longer than the 40km they said it will be. This weeks training was shorter sessions but at higher intensity level. Can't wait for those long hours on the bike and run waiting for me this December and January. Luckily this week was a "easy" week, hours wise as I attended two school functions and made a quick visit, or so I thought to the new company's HQ on Friday. On Tuesday we attended the Christian Society's evening at DJ's school and I was happy for her to be elected as a leader. Then on Thursday it was the Merit awards evening and highlight of the School year. DJ was so surprised to be named the Hockey player of the year and was also elected as one of the leaders for the new year. She also received Academic honour colours, definitely Kim's child, not mine. Friday I flew down to Port Elizabeth (a 1h25 flight) and had an early 3am start. I flew back at 7pm and thought I will have an early night compare to the previous one. Well not quite, I had my first "break down" in a VW in 18 years. Somehow the car's key lost it's coding and although I could open the car it didn't want to start. VW assist was quick to respond and help me but they had to take the car to a dealership as they couldn't code the key on the spot. That was quick but getting the car out of OR Tambo airport's parking almost took me forever. Never knew you had to complete so many forms to tow a car out of the airports parking. Well five hours later I was in bed just to be up and running in 4 hours to DJ's National championships dance competition. 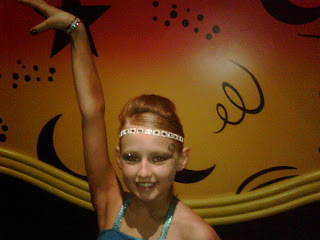 She did great and reached the quarter final in the Freestyle division and the semi final in the Slow dance division. She almost made the final in the slow dance division. They called back 4 girls after the semi final to dance for a spot in the final, think their scores were tide. Unfortunately she didn't make it but for her first year dancing, I am proud of her and she did great doing so well at the National Championships. This sign is on my way to work, maybe some advice, what do I need to do. Stop or keep going. J, congrats to DJ, big time. Nice trophy. 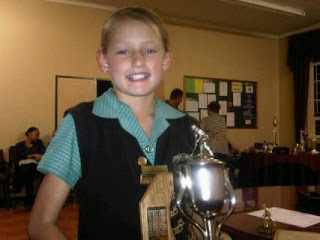 A girl that can Dance and play hockey and do well in school, cool combination. Still can't get over your 10km time, wow. And I love the commericals. haha. oh my gosh I keep commenting on this post and I keep forgetting the last part, word verification. NOT smart. So, one last time. Congratulations to DJ, fantastic job on the competition! Great pictures of her as well. 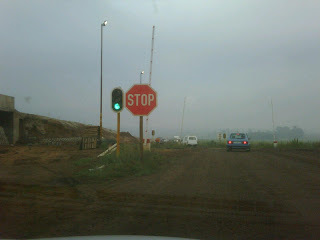 The videos made me laugh and I love the picture of the stop sign with the green light. what the heck!!! Way to go DJ - Well done girl. The guy watching would have a full time job calling BryBaby to order I reckon. Olympic Distance racing - your coach is right - it's a redline race from start to finish. Studys show that pacing in either the swim or the bike result in slower times than all out and hangon for the run - it's a painfest - I love it.